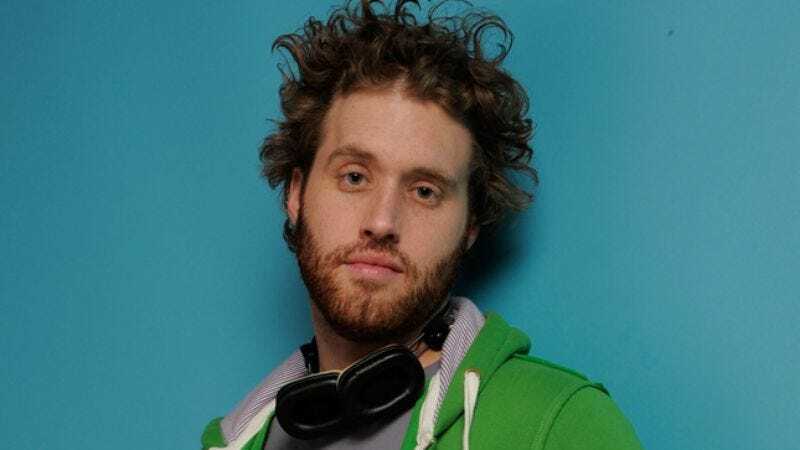 The actor: Over the course of just a few years, actor and comedian T.J. Miller has gone from unknown to ubiquitous. Miller first made an indelible impression on audiences as a jittery cameraman in the much-buzzed-about 2008 monster movie Cloverfield. High-profile work followed in fare like Gulliver’s Travels, She’s Out Of My League, and Yogi Bear, as well as this year’s Our Idiot Brother. Miller also contributed voiceover work to How To Train Your Dragon and its forthcoming sequel. Miller’s thriving film career is referenced throughout The Extended Play EP, a surprisingly catchy comic hip-hop CD that traffics extensively in goofy self-deprecation and was released recently on Comedy Central Records. T.J. Miller: Oh yes, of course, the secret first movie. I didn’t even know I was auditioning for Cloverfield. It was the first time I’d ever really been to Hollywood. I was doing the pilot for Carpoolers, an ABC sitcom that I was on that got cancelled after 13 episodes. They said somebody wanted to see me, they’d seen me in Aspen. The casting director of Paramount, she introduced me to this younger casting director. We had this meeting, and she said, “I have this role that I think you’d be perfect for. We don’t have real sides, I’ll send you fake sides.” And I didn’t understand what that meant. So she sent me sides, and it seemed like a terrible romantic teen comedy, like a Love Story thing. It was really awful. And I read for the wrong role in the beginning, I read for the serious part, and I was terrible. They just gave me the wrong sides. Then they asked me to read this other part that was a bit funnier. I said, “Okay, yeah, I can do that.” So I did that, and it went really well, and I got a callback and did it in front of J.J. Abrams. I didn’t know who that was, because I didn’t watch Lost. I just remember going in thinking, “I don’t know what this is, and I don’t care that much how the audition goes.” I got pretty crazy, and I was up on the table. I really acted ridiculous. It worked, and they cast me first. I was the first person cast in that film. And then of course I get the script, and then I find out that it’s a monster movie, and I’ll be filming most of it, which I did not know either. That’s the other weird thing, to get a huge, $20 million movie, and then you go, “Oh, and I’m filming it, also?” It’s weird. Weird first experience. AVC: At what point did you realize it had gone viral and was attracting all that buzz? TJM: We never knew if it would work, really. Even when we were filming, I kept talking to Lizzy Caplan, and she and I would be like, “I don’t think this is going to work. I don’t think this is going to be good.” We knew there was buzz around it, and J.J. was good at that, and as it got closer to the release date, we started to watch the fan boards and hear what they had to say about everything, and it was pretty amazing. I’d never seen anybody position a movie like that. TJM: Yeah, first film and television gig. That was such a weird thing. I got that out of Chicago. I’d just signed with these managers, not just just, but I had been working with them for a while, and I got this audition, and they said, “We think you’d be great for this role, it’s a really good part.” My managers represented Bruce McCulloch, and on the way to the audition, I was in the car on Lake Shore Drive in Chicago, and I remember very clearly where I had this moment where—I’d auditioned for a bunch of pilots outside of Chicago, and I was like, “Man, I’m sick of trying to do what I think people will like. Sick of trying to do what I think will get a booking. I’m just going to do what I think is funny.” So I wore underwear in the audition, and I brought a fake bookcase and set it behind me, and did a really weird take on the character, and they loved it, and I got the part. I flew out and did the chemistry-test thing, and then I got the part. AVC: And how was the experience of doing a network sitcom? TJM: Very bizarre. For my first two things to be an ABC network sitcom, for what’s considered an alternative comic for Chicago to do that, and also to do a horror movie where I was filming, was pretty ridiculous. TJM: Oh yeah. I acted in high school, and studied at the British American Drama Academy in Oxford for one summer. I minored in theater, and I was always acting growing up and stuff, but really, I was just more interested in the comedy of it all. So for me, it’s always comedy, and then acting is just one medium of comedy. TJM: It was an underrated film. Mike Judge usually receives underwhelming critical acclaim for his movies when they come out. That was one where I loved the script; I just really thought it was incredible. It was one of the best scripts I read in Hollywood. That was one of the only films I actually pursued. Yogi Bear, ironically, I did that whole thing as a joke, from that weird audition with the bear all the way through. But Extract, I really wanted. There was only one part I could be, and I don’t look at all like the character description. And Mike Judge is an animator, so he has very clear pictures of what he wants in his mind. So I auditioned, I was funny, and he really likes me, he really likes me, but he kept saying, “No, no, he doesn’t look right.” I said I would do anything. Finally, I emailed him. I tried to figure out how to get an email to him. I said, “I’ll change my appearance, whatever you need.” He said, “Okay, shave the side of your head and dye your hair black. Straighten it, make it long, and we’ll put in all these fake piercings and tattoos.” And I said “Okay.” And every morning, it took three or four hours to get everything ready. Hours in the trailer sitting next to Gene Simmons as he got his weird hair treatments. AVC: Did Gene Simmons have a lot of weird stories? TJM: Oh yeah. He doesn’t really tell stories, he just sort of brags about his life. TJM: That was weird. I had done Carpoolers, which was a DreamWorks television show, and I’d done She’s Out Of My League, which is a DreamWorks film, and so then DreamWorks animation came to me and said, “Hey, would you like to read for this thing?” So I read for it, and they liked me. It was originally going to be with Busy Phillips, this girl who’s on Cougar Town now, and then Kristen Wiig was the one that ended up doing it. AVC: It seems like DreamWorks is very, very fond of you. TJM: Oh yeah, they’re the best. TJM: I don’t know how that happened. Ethan Suplee and I would always turn to each other on the set and be like, “What are we doing here again? How is this possible? Why are we in this action film with Denzel Washington?” He did two other movies with Denzel Washington. But they asked me to audition for it, and I said, “Well, what is it?” And they said, “It’s this train movie.” I was like, “What? I don’t think I would be good in that.” They were like, “No, they sort of want the two first guys to be funny.” I said, “I don’t see how this could be funny, because the sides are like ‘Dewey, take D-nine down to track 14. Six-four. It’s a three-one-seven.’” It’s all railroad jargon, there’s no way to make that hilarious. And so I went in, I did it, it was fine, and they asked me to do a callback. I came in, and Tony Scott is in the room. I was like, “I love [The Taking Of] Pelham 123,” because I’m such a huge fan of his. I love his movies. I went in, I was kind of joking with him, and I did this audition. It wasn’t really funny, but he was laughing the whole time. I think it was because I look funny to him. I think the idea of me and Ethan Suplee working on a railroad for whatever reason makes him laugh. So he gave me the part. It was pretty funny. AVC: And that’s based on a true story, is it not? TJM: Yeah. We met the actual guys that stopped the train, it was pretty crazy. AVC: And how was that, meeting the character that you played? TJM: I didn’t get to meet the character I played, but the two guys who saved the train, we met them. The guys that Ethan and I played, I think are working different jobs. AVC: That’s also referenced on The Extended Play EP. TJM: That’s right. That’s sort of one of the ideas of the album. I wanted to, in the weirdest possible way, reference all these—there’s all these callbacks. I do this line in album where I go “Alicia Keys.” And that’s a really esoteric reference to She’s Out Of My League. I bang my leg in one of the scenes and I say, “Mary J. Blige!” So the album is filled with all these weird connections. I took a page out of J.J. Abrams’ book. AVC: Another movie of yours is referenced on the album: Yogi Bear. TJM: Oh yeah. As much as I can. It’s rare that you do something in your life that’s that good so early on that you know you’re never going to do another movie of that caliber. But they asked me to audition, and I thought it was pretty ridiculous, because I’m a comedian, so I was like, “What do you need me in this kids’ film for?” They said, “You would be funny, and the casting director is Allison Jones,” and I knew her. So I went in for fun and auditioned. And then they asked me to do a callback. They said they loved me, but wanted me to read for a different ranger. I thought that that was so funny, so I made that video with the talking bear. And I tried to get it to them before the callback, because I thought it would be so funny to go into the callback and say, “That is my live interpretation, and here is some additional material.” But we couldn’t get it edited fast enough. So I did the callback, and the offer was already in motion when I sent them this video of me with an actual bear that I rented for a thousand dollars—best investment I’ve ever made. And they thought it was hilarious. They showed it to Alan Horn, the president of Warner Bros., because it was so crazy. But on the Internet, it was great, because everybody said, “Well great, all you have to do is hire a bear. T.J.’s awful in that bear video. He shouldn’t get the job.” It’s so funny, because it was all a joke. I was acting terribly in the tape on purpose with a real bear. In a ranger’s outfit. Why would I ever do that for real? TJM: That was one where I didn’t know what was going on, and I felt like—I don’t know. I did a pilot, and it didn’t go. TJM: It was called Waiting To Die. I found that out in the morning, and I was on set of Get Him To The Greek, and I was in a terrible mood. And then they call me and go, “Oh, but now you can do Gulliver’s Travels.” I was like, “What? What is that?” They were like, “You auditioned for it months and months ago. They really liked you.” I remember that audition. I did very poorly in the regular audition, then the guy said, “Why don’t you just improvise one? Just do an improvised scene.” And I did that, and he loved that. So that was another one where it ended up behooving me to be free-form. Most things I get hired on, I get hired because I improvise something funny, or they just think I look weird. AVC: What about the actual filming of Gulliver’s Travels? TJM: That was in England. So they flew me out to London, and every day I lived there and worked with Jack Black. And he’s incredible. He’s one of those guys in Hollywood where everybody says he’s so great, and you think he’s going to be such a terrible weirdo. And he isn’t. He’s so great. TJM: Right. Yeah, that was weird. Chris Pratt couldn’t do it, I guess. He got something else. They had cast him in that role, I think, then he couldn’t do it. Then they came and offered me the role. I never auditioned for it. They said, “You know, we think you’d be good in this, would you like to come?” And I said, “Yeah, sure, I’ll go and do that.” Because I couldn’t believe the cast. The cast was so amazing, and they ended up letting me improvise a lot on that one, too. And they wrote new scenes for us, and it was great. I had a really nice presence in that film. That’s another one where people enjoyed that film, and they kind of enjoyed my part in it, but when I was doing it, just like in Extract, I didn’t think anything I was doing was that funny. Sometimes things need to be so understated on film, which isn’t really my style, comedically. When I watch film comedy, I like people that are a little bit more alive on the screen, and wound up. AVC: Have you made films where you did think you were funny? TJM: Yeah, I think I did a pretty good job in She’s Out Of My League. I rewatched that recently. And I think I have one or two laughs in Unstoppable. Cloverfield I thought was pretty good. And Yogi Bear, of course I thought was incredible, I thought my performance in that was pretty amazing. But Cloverfield, I would say, for sure Cloverfield was hard to pull off. It was my first movie. I was filming. I had to figure out how to be funny. It just seemed like I was doomed to fail from the get-go. I ended up doing okay. And people liked me in that movie. That’s my biggest thing: I just want people to enjoy me in the movie. I know a lot of actors will say the whole thing where they go, “I don’t like to watch myself, I don’t like to see what I do,” and I can’t get that at all. It doesn’t matter to me if I’m in love with my performance, so I watch all of my performances to understand and learn from them, and figure out what’s working and what’s not. And I see the movies that I’m in in the theater a lot. AVC: When you see them, do you go see them with an audience? TJM: “The movie that everyone in Hollywood is in,” is what everybody was calling it. Yeah, that was just a lucky thing with the script. Everybody loved that script. That script was unbelievable. That girl is super, super talented. Lorene Scafaria. She’s amazing. So I heard everyone who’s in it, and I auditioned for this “Chipper Host” part, this host who’s on ecstasy when the world is ending. It’s just a cameo role, but it’s so funny. I think that movie is going to be beautiful, hopefully. TJM: That is another one I improvised. I brought in actual beer. I brought in malt liquor and dressed like a gangster, because that was the original scene. And they thought that was pretty funny. Then they asked us to improvise a scene where I was the concierge, and I did it, and it was pretty hilarious. They were into it, and they cast me on it. I think I’m onscreen for less than a minute or something. It’s my favorite role in the movie; I wouldn’t have taken any other role. AVC: It seems like it could also be an extremely fun movie to make. TJM: That was a fun one. Those guys are cool. [Director] Nick Stoller is great. A very laid-back set. Russell Brand is lovely, even though he’s a weirdo. TJM: That one, they passed on me. They said they didn’t like my audition, originally. They were going to go a different direction. Then Cloverfield came out, and I was so well-reviewed, they said, “We’d like you to do the movie.” That was my first taste in Hollywood that people go with the hype. They go where the direction, the momentum is going. AVC: And did you feel vindicated? TJM: Uh, yeah, I did. I actually was considering not taking the role because, I don’t know, it was pretty broad, the script. But I took it on. People love that movie, they love me in it. So I’m really pleased. I’m always so amazed by which performances work really, really well and which ones don’t. But I think it’s just mostly, She’s Out Of My League, so many people saw that movie on DVD and on the plane. Just millions of people saw that movie. That’s the reason I’m somewhat famous. AVC: That’s the thing about films, they have a second life. TJM: Yeah, and they have a real permanence with people.